Sarah Palin's book doesn't come out til next week, but recriminations and denials are already flying in every direction. Today: More on Katie Couric's alleged low-self esteem, and the AP's close reading. 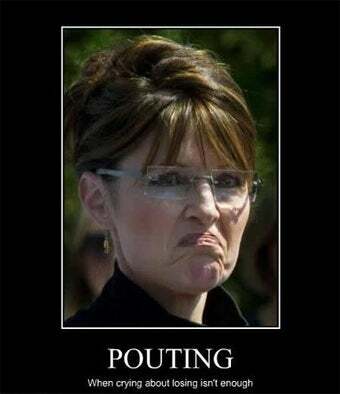 An unnamed McCain aide is disputing Sarah Palin's charge in Going Rogue that they gave Katie Couric access because of pity of Couric's alleged "low self esteem": "The truth is, she refused to prepare for the Katie Couric interview," the adviser tells The Plum Line's Greg Sargent today. "She refused to engage in any preparation. And it was a disaster." This should be familiar to anyone who remembers the last time the McCain campaign and Palin engaged in all-out sniping — just after they lost. Of course, it's still possible that's not what Palin said at all, at least if you take her word for it. She wrote on her Facebook page today, "As you probably have heard, the AP snagged a copy of my memoir, 'Going Rogue,' before its Tuesday release. And as is expected, the AP and a number of subsequent media outlets are erroneously reporting the contents of the book." It will shock you that Palin provided no examples. Earlier: Leak Reveals No Levi, Plenty of Katie-Bashing In "Going Rogue"